Shri Digambar Jain Lal Mandir dedicated to 23rd Tirthankara Parashvanath the oldest Jain temple and the temple is known for its unique architecture in Delhi which is popularly also known as Lal Mandir (Red Temple). 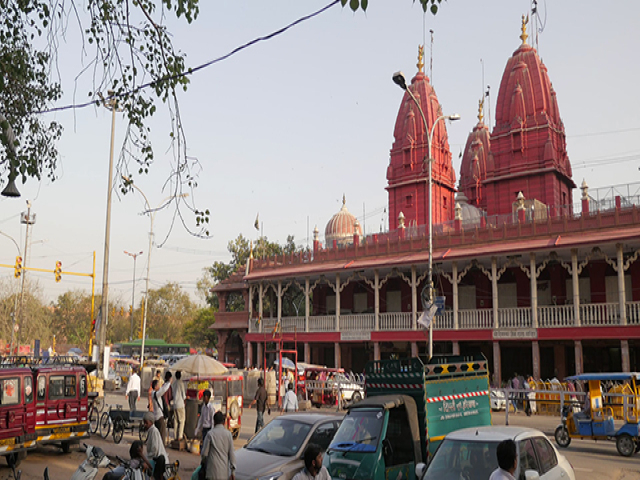 The Shri Digambar Jain Lal Mandir is located in a in Delhi just opposite to the most popular landmark namely the Red Fort and at the junction of the Chandni Chowk and Netaji Subash Marg was built in the 17th century. A manastambha column stands in front of the temple. The main devotional area of the temple is on the first floor. The temple is adorned with shrines of the great Lord Mahavir who was a Prince born in 599 BC in Vaishali city known today as Bihar. The temple also imbibes the statues of Lord Adinath and Lord Parasnath who succeeded Lord Mahavir. By airways: The Nearest International Airport to reach is Indira Gandhi International Airport. Visitors have to visit Digambar Jain Temple for during the annual events. The important festivals near the temple are Paryushan Samvatsari Deepawali and Jnaan Panchami.